Jerome Balmuth, Harry Emerson Fosdick Professor of philosophy and religion emeritus, passed away Thursday, September 28. Balmuth’s storied career at Colgate began in 1954, when he joined the Department of Philosophy and Religion after receiving his undergraduate degree from Amherst College and an MA in philosophy from Cornell University. In 1995 he was named Harry Emerson Fosdick Professor of philosophy and religion. He retired in 2010, after 56 years of full-time teaching; his love of teaching brought him back to the classroom for part-time teaching for another year. 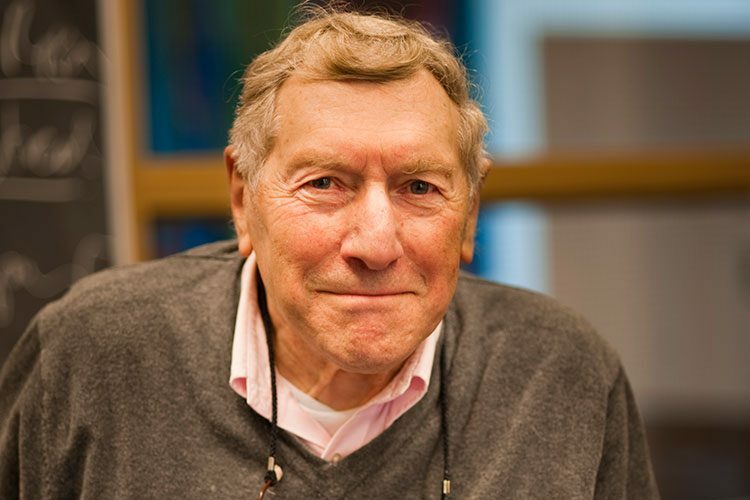 In retirement, Balmuth remained a vivacious member of the Colgate community, attending lectures and concerts with his wife, Martha, and talking philosophy with his colleagues. Born in Brooklyn on May 8, 1924, Balmuth seemed destined to join the family business until the Second World War intervened. He was drafted into the U.S. Army in 1943 and served in the European theater during the final Allied assault on Germany; he served in the Dachau concentration camp shortly after it was liberated and turned into a POW camp. He attended officer school, was commissioned as a second lieutenant, and was discharged at the rank of acting captain. The GI Bill enabled Balmuth to study at Amherst, which lay a world apart from his Brooklyn boyhood and European army service. There, he found his calling in the study of philosophy. At Cornell, he studied with many of the leading lights of 20th-century philosophy and, through them, first encountered the thought of Ludwig Wittgenstein, whose work was just beginning to be known in America. This encounter set Balmuth’s path for his research and teaching: Wittgenstein’s characteristic philosophical move is overcoming a philosophical debate by identifying and challenging the unexamined assumptions that underlie it — and Balmuth loved challenging assumptions. Balmuth’s philosophical interests were unusually broad. He regularly taught courses on logic, aesthetics, ethics, the philosophy of law, the history of philosophy (especially that of the modern period), the philosophy of language, and a celebrated seminar on Wittgenstein; he was also an active participant in Colgate’s “Gen Ed,” the ancestor of today’s Liberal Arts Core Curriculum. Balmuth read widely, both classical works and the latest journals, and was well informed about and eager to discuss any and all philosophical issues. He was a penetrating critic and questioner, with an indefatigable determination to get to the essentials of a problem and little sympathy for verbal gymnastics that impress but do not illuminate. Balmuth’s teaching transformed generations of Colgate students. He expected his students to prepare thoroughly and to think for themselves, and he grilled them intensely to make sure they were doing so. While he could be intimidating in the classroom, he genuinely sought to know his students, to find out their backgrounds and aspirations, and to advise and mentor them. He took his students seriously, and inspired them to take themselves and their education seriously. A point of special pride to Balmuth was how many of his students went on to graduate study and successful careers as teachers of philosophy; to the end of his life he kept a mental tally of all 100-plus such former students, and of the many others whose lives he had influenced. Balmuth garnered every teaching award that Colgate offers: the Alumni Corporation Teaching Award (1988), the AAUP Professor of the Year (1992), Phi Eta Sigma Professor of the Year (1994), and the Sidney J. and Florence Felten French Prize for outstanding teaching (1997). In 2009 Mark Siegel ’73 established the Jerome Balmuth Award for Teaching to honor “a faculty member whose teaching is distinctively successful and transformative, recognizing that such distinction can be achieved through a broad spectrum of methodologies ranging from traditional to innovative.” Former students, as well as friends and family members, also endowed the Jerome Balmuth Fund — which supports visiting speakers and enhances the outreach of the philosophy department — and the Balmuth Endowed Scholarship Fund. Balmuth chaired the philosophy and religion department, and throughout his career he shaped its hiring, policies, and curriculum. Balmuth took great comfort and inspiration from his close professional friendships with other faculty and with members of the larger Colgate community. Balmuth strove to make Colgate a more inclusive and broad-minded institution. He taught in an early version of the Office of Undergraduate Studies and became a mentor to many African-American students, and he welcomed the arrival of female students when the university became coed in 1970. One of the first Jewish faculty members, he supported the establishment of the Saperstein Center. Balmuth and his wife, Ruth, were instrumental, along with other Colgate families, in the founding of a vibrant interfaith Sunday school for children of the community. Balmuth was predeceased by his first wife, Ruth, and his brother, Daniel. He is survived by his wife, Martha; his sisters, Lorraine Widman and Marilyn Stolove; his children, Deborah Balmuth (Colin Harrington), Beth Raffeld (Philip Khoury), and Andrew Balmuth ’89 (Akemi Ohira Balmuth); and his grandchildren, Eli Raffeld ’10 (Jennifer Wu Raffeld), Miriam Raffeld, and Hanna Balmuth. He is also survived by many nieces, nephews, grandnieces, and grandnephews — including David Balmuth ’82 and Amy Balmuth ’17. Gifts in memoriam may be directed to the Jerome Balmuth Endowed Scholarship Fund through the advancement office of Colgate University. The Colgate community is invited to a Celebration of Life event, which will be held at 4 p.m. on Saturday, December 16, in the Colgate Memorial Chapel.